"I only hope he likes Shakespeare." "The Perfect Mate" is about a woman named Kamala, an empathic metamorph, who reflects back at every male she meets whatever he desires her to be, right up until she permanently bonds with one particular man. Then, apparently, she is stuck reflecting the desires of that particular man for the rest of her life. Well, let's get the obvious out of the way. Despite the attractive window dressing, Kamala is a slave. She was taken from her mother at the age of four and has spent her entire life preparing to be someone's mutant super geisha. She cannot choose a profession, express her own personality or develop her own interests. She hasn't even been permitted to spend time alone. It's much worse than prostitution, something Crusher mentioned to Picard in a private conversation, because at least prostitutes can choose whether or not to be one. Plus they get time off to be themselves. According to Ambassador Briam, male metamorphs are a dime a dozen on his planet, but female metamorphs are extremely rare, only occurring once in seven generations. What if this plot had been reversed and a rare male metamorph was to be presented as a gift for a female leader of Valt? What if this male metamorph had been throwing pheromones and passes at Beverly, Deanna and Guinan? Even with an exceptional actor in the role, it probably would have come across as exceedingly creepy. All that said, this episode wasn't a complete loss. Famke Janssen, a good actress who was also absolutely stunning, managed to convey to the audience that there was a lot more to Kamala than her beauty and supernatural sexual magnetism. And I'll readily admit that some of the early scenes were pretty funny. I liked the Ten Forward scene where every male but Data had their tongues figuratively on the floor. Plus, five minutes out of stasis, and she was attaching herself to Riker's lips. I thought his comment, "If you need me, I'll be in Holodeck Four," was hilarious. It was way past time that someone referred to an obvious use of the Holodeck that never seems to get mentioned. I do have to ask why Kamala's pheromones would affect human males, or those grunting alien sailors, who clearly weren't her own species either, for that matter. I also hated that Kamala required a chaperon because she was so sexually provocative, a reminder of how young women were treated in previous centuries. Okay, moving on, I'm moving on. While Kamala smooched with Riker and growled at Worf, the man who genuinely intrigued her and became the focus of her interest was Picard. Her choice belied the earlier implication that Kamala had no real personality of her own, and added a mildly poignant note to the story. 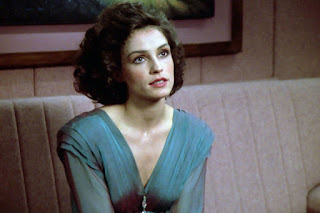 She told Picard, "I wish I could convey to you what it's like to be a metamorph. To feel the inner strength of someone. To realize that being with him is opening your mind and heart to endless new possibilities. To hear yourself say, 'I like myself when I'm with him'." She even liked the fact that, even though Picard clearly wanted her and she was throwing herself at him, he had the discipline and strength to resist her. At the end of the episode, Kamala made two choices that would govern the rest of her life. She decided to go through with the arranged marriage in order to save her people, even before she met her bridegroom. And then she chose to permanently bond with Picard, even though she could never be with him. We know that she will probably be miserable with Alrik, who turned out to be prissy and unattractive and only interested in trade agreements. (At one point, Alrik literally had his nose in the air.) But even though she sentenced herself to a lifetime of marital misery, Kamala essentially chose the sort of person she wanted to be when she chose to bond with Picard and become a reflection of him. That was actually rather touching. There's an age difference between Famke Janssen and Patrick Stewart that jumps out at me now, in 2017. But in the early nineties, Patrick Stewart had a huge female following, myself included, and the age difference didn't bother me then. The Next Gen producers wanted to include romantic episodes for Picard without actually pairing him with someone permanently. But interestingly, this episode suggested that a romantic relationship was forming between Picard and Beverly Crusher. How long have they been taking meals together and sharing confidences? It felt very much as if they were also sleeping together, except that if they were, she wouldn't be giving him advice about his love life. The plot of "The Perfect Mate," at least in the reluctant but supernaturally attractive bride category, was very similar to the original series episode "Elaan of Troyius." Also, the first thing that Kamala said when she emerged from stasis was "I am for you, Alrik of Valt," which is what Lee Meriwether's character on "That Which Survives" said to each of her victims before she killed him. The much despised Ferengi made an early appearance so that someone could be greedy and rude and break Kamala's cocoon too early. One of the two Ferengi characters was portrayed by Max Grodenchik, who later played a recurring Ferengi character named Rom on Star Trek: Deep Space Nine. Way back when, Famke Janssen turned down the role of Jadzia Dax in Deep Space Nine. Maybe that's why they gave Terry Farrell, who ultimately won the role, the same spots that Janssen wore in this episode. Coincidentally, Famke Janssen also went on to play another empathic mutant, Jean Grey, in the X-Men movies that of course included Patrick Stewart as Professor Xavier. Finally, it seemed odd to me at first that Deanna Troi wasn't in this episode. And then I thought about it. They wanted to do an episode about an absolutely gorgeous empathic alien woman. Who does that sound like? Maybe they were worried that the characters had too much in common and didn't know how to write around it. -- Stardate 45761.3. Transport of Kamala as "cargo" from Krios to Valt Minor. -- Did Kamala only have the one dress? I guess that makes sense if she was supposed to be in stasis until the wedding. But didn't she pack a change of clothes? What about fresh undies? The idea that Kamala had no personal belongings to take along to her new planetary home with her is disturbing. -- Ambassador Briam teaching Picard to play the alien xylophone seemed silly. -- When caught in the cargo bay, the Ferengi said they were looking for a barbershop. But they don't have any hair. At least I assume they don't, since there is none visible. And now I'm thinking about concealed hair on a Ferengi. What an unpleasant thought. Picard: "Nothing, nothing lies beneath. I'm really quite dull. I fall asleep each night with an old book in my hands." Kamala: "When a metamorph finds you interesting, do not take it lightly." Picard: "Oh, I'm not taking it lightly. I'm just trying to be as dull as possible." Kamala: "Do you find me unattractive?" Picard: "I find you unavailable." Kamala: (to Picard) "Talk to me. I love the sound of your voice." Crusher: "...for your thoughts. Penny for your thoughts." Picard: "Do you have one?" Crusher: "I'm sure the replicator will have one on file." Picard: "Beverly, may I take off the uniform for a moment?" Nice review, Billie. I especially like the reverse situation that you posited. Having a female being beautiful and desirable to men in almost any situation is not a big deal, it's expected...but if Kamala had been a man and did the same things she did, it would be creepy. I don't know how Kamala is going to be happy in her new life. I would think that she would be repulsed by her husband and long for Picard. That's sad. Nice comments...but consider this before judging Kamala. Kamala is amazingly sincere and vulnerable.. yet very strong...she is who she is and no comments through the prism of a human prejudice (male or female) is valid. It is not different from being who you are because you are gay. I find the end logical yet unexpected. She elects duty over love, a trait that, as she states, is defining a ship's captain. Picard's influence is thus of the highest ethical quality proving that "pleasing a man" is of the most important meaning, at a non-trivial level for Kamala. A brilliantly tragic episode played to perfection.